Amidst the big-picture stuff, two things at the Ford museum stuck out: The map showing the outcome of the 1976 election had the red and blue states as they’re supposed to be — the Democrats in red and the Republicans in blue. Has anyone tried to dig out which graphic artist or art director at one of the networks decided to change this in 2000? It has to have been a considered decision by a leftie who didn’t think the Democrats should be portrayed as the reds, but I’ve never seen the name(s) of the specific person or persons responsible. color of the incumbent party alternates every 4 years. 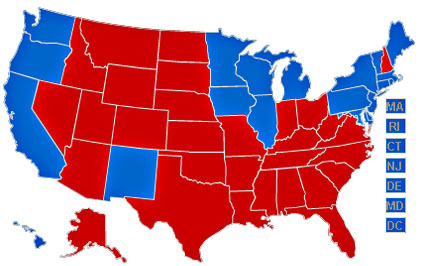 In 2000 the formula produced blue for Gore and red for Bush, and shortly after that the famous electoral map showing blue coasts and a vast swath of red everywhere else made its debut. This prompted everyone to start talking about red states and blue states, and ever since then it’s stuck. Something tells me this is an explanation that’s going to have to be repeated every few years. 1The best answer I’ve been able to come up with, anyway. However, state colors have varied over the years, and not all networks and print outlets followed this formula perfectly. But it seems to have been pretty common, and in any case it was just a coincidence that Democrats got colored blue in 2000 and that was the election that produced a famous map. Just luck of the draw.